Coworking Spaces vs. Coffee Shops. Which is Best for Productivity? 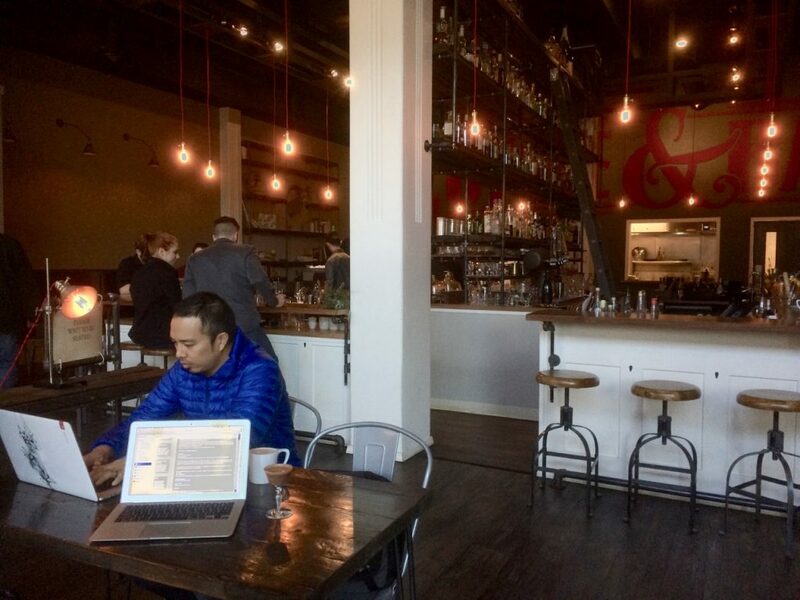 Coffee shops and coworking spaces can both be great places to talk business with a client or get some work done. The question is, which one is better? The answer all depends on what kind of work you are trying to get done and what environment is best. Below are some pros and cons of both for you to consider. Coffee shops – pros Good coffee and treats – This is pretty obvious. At a coffee shop, you can probably get good coffee. You can probably also snack on bagel or doughnut as well. You are working hard. Why not reward yourself? Free Wi-Fi – Most coffee shops have free Wi-Fi so it is easy to take care of e-mails, do research online, etc. For the price of a coffee, you can hangout and use the internet. This is beneficial if you do not have internet at home or if you are more productive when you get out of the house to get work done. Casual – Coffee shops are usually relaxed settings. If you work best in a casual setting with music and people chatting or reading the paper, this may be your vibe. Also, if you have clients that appreciate a more informal meeting space, a coffee shop might be the right spot. They’re everywhere – If you are in a major U.S. city, you probably do not have to walk very far to find one. This can be convenient as it probably does not really matter where you are in the city, you can still get work done. Coffee shops – cons Noisy – If you need to focus, this might not be the optimal environment. You never know if a toddler is going to be at the table next to you banging spoons on the table or if a pair of really loud talkers are going to start a conversation nearby. And what is the point of choosing this environment to work if you have to bring headphones to block out all the disturbances? Distracting – Whether you really dislike the distractions, like those mentioned above, or maybe you are a dog person and you cannot resist petting the Beagle that just walked in the door, a distraction is a distraction. When other people in the space are not there to work, it can be difficult to keep your mind on work and be productive. Limited ‘desk’ space – Have you ever sat in a coffee shop with a laptop, some paper documents, a latte and a scone? Do you end up shuffling everything around the small table? Worse yet, have you tried talking to someone about a project while you both have your laptops and coffee on the table? It is not ideal. Unreliable Wi-Fi – While you can access the internet for free with a food or drink purchase, providing great Wi-Fi is not the core of the business. Sometimes the internet is not so great when there are twenty different devices connecting to it so you may sit down and then find out that you are not getting online or each page takes three minutes to load. Must buy something – A coffee shop is a business. It makes money off of food and drink sales. This means you will be buying food or a drink every time you go here to work. Additionally, if you plan to stick around for a number of hours, many people feel pressured to buy something else after an hours or two. This can get pricey. Coworking spaces – pros Work environment – It is generally easier to focus and get work done when other people around you are doing the same. Think of it like a gym membership. You could do pushups and sit-ups in your living room and buy some weights to workout at home but you will probably end up sitting on the sofa watching TV. We buy gym memberships because when we go to the gym, everyone else there is working out, which pressures us to do the same, and the place has been set up to be conducive to that activity. A coworking space is a good place to work because everyone else there is working and the place is purposefully set up to be conducive to work. Additionally, unlike a coffee shop, feel free to stick around for hours. You have paid to use the space so get your money’s worth. Designated meeting spaces – If you need to meet with someone or a group, coworking spaces generally have meeting rooms you can use. This means you can go to a quiet area with plenty of space to set up multiple laptops, a projector, etc. Reliable infrastructure – The purpose of this business is to make sure you have a great space to get work done. Reliable internet, printers, power outlets, and other things that make working easier are maintained and in working condition. Casual or formal – You can meet with someone or work in the coworking space alongside everyone else in a communal, fairly laid-back area or there may be office spaces you can rent that give you your own formal office. There’s still coffee (and a fridge) – Coworking spaces generally offer free coffee and tea with your membership and have a fridge. This is great for people who want to pack a lunch and save their cash on eating out and spending a few bucks a day on coffee. Business network – Coworking spaces are often home to cohesive business networks. In these spaces you can meet all kinds of professionals who are happy to contribute to their community when possible. Sometimes that means there is a marketing expert who is happy to share a few free tips with you or a freelance bookkeeper that you know and trust who would be happy to offer their services. Coworking spaces – cons Must commit to a membership – Most coworking spaces want you to sign up for a monthly membership for you to be able to work there. Depending on your budget and how willing you are to commit to that, this may or may not be a deal breaker. Limited locations – While coffee shops are located all over the city, if you get a membership with a coworking space, you are limited to one or a handful of available locations. Depending on your lifestyle and work needs, this may or may not be a fit. Having said that, more and more networks of coworking spaces are popping up so you can get a membership that applies to five different location and they may be in the same city or in various major cities across different continents. It is clear that coworking spaces generally have more pros than cons as compared to coffee shops. However, you know your own work needs best. After considering your options, the most important thing is that you make sure you are working in places that are conducive to your success.